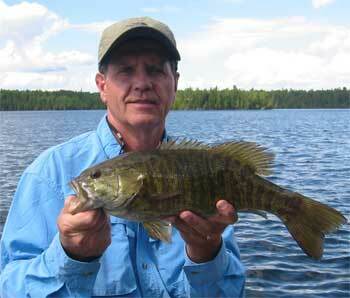 Smallmouth Bass: Smallmouth Bass are very plentiful on our lake system in all different size classes. Fishers catch large numbers of Smallmouth between 12 to 17 inches, most being the fat football shaped type that put up a never ending fight. Fishing at Fireside Lodge you can also expect to catch trophy Smallmouth between 17 to 20 inches, and we have guests catch GIANT Smallmouth every year over 20 inches. Some of the best catches over the years have been a number of Smallmouth between 20 to 22 inches, and 23, 23.5, 24, 24.5 and the largest to date measured 25 inches. WOW!!!! All those monsters are back in the water swimming, and waiting to be caught another day. The most impressive thing about Fireside Lodge Smallmouth is the girth, being very fat and heavy and often people fishing at Fireside Lodge for their first time, never seeing Smallmouth this big, think the fish they are catching in August are full of spawn. Of course they are not, as they spawn in June, but they are so fat it just appears that way. 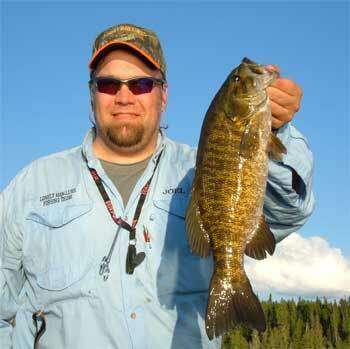 For more information pertaining to seasonal movements and techniques used during different time periods to catch Smallmouth Bass at Fireside Lodge go to our special Smallmouth Page. 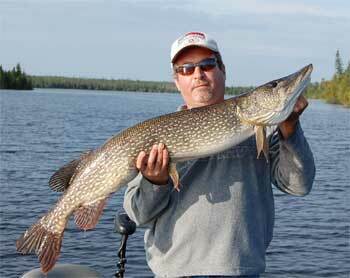 Northern Pike: Having 9 different lakes to fish for Northern Pike is any Pike fisherpersons dream. At Fireside Lodge you can target fast action and fun or HUGE Trophy Northern Pike, and land the biggest Northern Pike of your life. 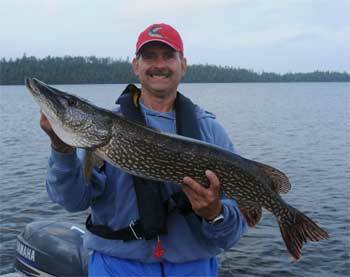 We have a few lakes that are portage lakes, and at times can catch so many Pike you will get tired of catching them. On all the other lakes there are a variety of sizes, however we are known for having very heavy Northern Pike, and can expect to catch many between 26 to 38 inches. We have a large population of Northern Pike between 38 and 45 inches, and Fireside Lodge guests experience catching these GIANT wide bodied Pike every year. Largest recorded Northern Pike caught is a 48-inch beast. 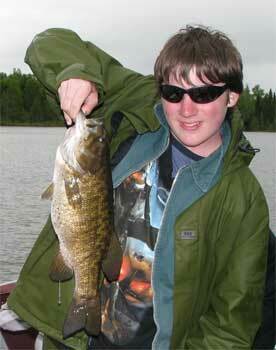 Make sure to refer to our pictures and see Fireside Lodge guests smiling faces with their catch. Remember that all these great catches are released, which increases all Fireside Lodge guests�?? potential to have the same wonderful experience. However you enjoy fishing for Northern Pike, they are loads of fun, always giving the fisher an exciting feeling when attacking their lure, and then holding on for those long fast exciting runs. For more information pertaining to seasonal movements and techniques used, during different time periods, to catch Northern Pike at Fireside Lodge go to our special Northern Pike Page. Muskie: Fireside Lodge and Little Vermilion Lake System is very well known for it�? 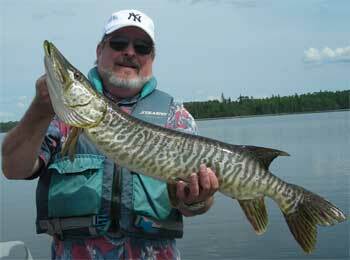 ?s FABULOUS Muskie fishing. Just having five different Muskie Lakes on the same lake system is very special, being that each lake is a different size with a variety of depths, with four of the lakes being connected by creeks. Two of these lake are Muskie Sanctuaries which were closed to fishing for many years, and then the Ministry of Natural Resources opened them with special protection regulations, to preserve their special reproductive characteristics. These lakes feed the other larger lakes creating a natural hatchery. Little Vermilion Lake system gives our guests an opportunity to catch a Clear Muskie, Barred Muskie, Spotted Muskie, and Tiger Muskie. 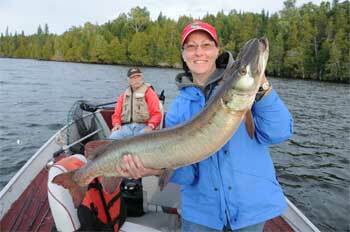 At Fireside Lodge we have had guests actually land 12 Muskie in one day�? ?s effort, and they are the wide body type that will give anyone a challenge during the fight. 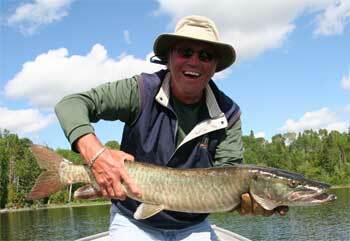 Whether you are the experienced Muskie angler or the novice, you will get hooked on Muskie fishing at Fireside Lodge. 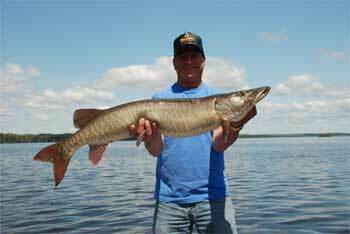 Over 20 years countless beginners have caught their first Muskie at Fireside Lodge, and many Fireside Lodge guests go home catching the biggest Muskie of their life. We catch many in the 30 to 40 inch range and many guests see, hook, or land, Monsters 40 to 50 inches. Then there are the heart stoppers that some guests get to experience. For more information pertaining to seasonal movements and techniques used during different time periods to catch Muskie at Fireside Lodge go to our special Muskie Page. 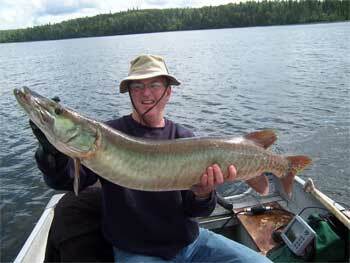 Tiger Musky: This is a special bonus guests at Fireside Lodge fishing Little Vermilion Lake System can experience. Most people know Tiger Musky as a stocked fish, however in Little Vermilion Lake System these are naturally occurring (See our section on Musky for an explanation of how this happens) and the fight they give you after hooked is terrific. Wide-bodied and reaching lengths in the high 40-inch range they can be more than some fishers can handle. The fight is a combination of the long, hard, fast runs of a Northern Pike with the strong thrashing and acrobatics of a Musky. After landing this fish you will be amazed at the beauty of the color and natural markings, which make for a fabulous photo. Make sure to look at some of the photos on our Fishing Photo Page. Also, for more information pertaining to seasonal movements and techniques used during different time periods to catch Tiger Musky at Fireside Lodge go to our special Musky Page. All Photos on this page are Fish that were caught and released by Fireside Lodge guests.